Is heaven an actual place? Is there a literal location for hell? Can we know for certain where heaven and hell really are from the Bible? I believe we can. My first thought is that heaven is any place where God is and hell is anyplace where God is absent. People loosely use the term, “this is heaven” when they taste delicious foods or have an enjoyable experience, but can anything really compare to what heaven will actually be like? I believe that heaven can not thoroughly be explained, even by the Scriptures, for it must be too wonderful for words and it must be too indescribable to relate to by word pictures. Many people have images of us going to heaven and floating on a cloud and playing harps while chubby little cherub angels fly around us. This is nothing like the heaven that is described in the Bible and to know what and where heaven is, we must rely on the Word of God and not in human imagination. These amazing Holy Angels praise God without ceasing. In Revelation we see that, “Each of the four living creatures had six wings and was covered with eyes all around, even under his wings. Day and night they never stop saying: “Holy, holy, holy is the Lord God Almighty, who was, and is, and is to come“ (Rev 4:8). Heaven is very real or the Bible is wrong, which we know that it is not. Again, remember that heaven is any place that God is present. That’s what makes heaven, heaven. Here we read that the New Jerusalem comes down from heaven and this is the establishment of the Kingdom of Heaven which Jesus spoke of. Jesus said that “if I go and prepare a place for you, I will come back and take you to be with me that you also may be where I am” (John 14:3). Jesus said that heaven was as a place and that He would come back to take us with Him to be where He is. So heaven is a real place and that place is where we will be and where Jesus will be with us. At least it will be for those who have placed their trust in Him. Further, “It had a great, high wall, with twelve gates, and at the gates twelve angels, and on the gates the names of the twelve tribes of the sons of Israel were inscribed— on the east three gates, on the north three gates, on the south three gates, and on the west three gates. And the wall of the city had twelve foundations, and on them were the twelve names of the twelve apostles of the Lamb” (Rev 21:12-14). So this New Jerusalem has walls, gates, and it is called a city. This is no cloud floating, harp playing place, but an actual, literal location with real, tangible things in it. And heaven is huge! How big? This “city lies foursquare, its length the same as its width. And he measured the city with his rod, 12,000 stadia. Its length and width and height are equal. He also measured its wall, 144 cubits by human measurement” (Rev 21:16-17). This is an immense city that Bible scholar’s estimate will span about 1,300 square miles wide, 1,300 square miles long and 1,300 square miles high. The square footage is in the billions! This city has foundations, walls, gates, streets, and a temple but the temple is God Himself (Rev 21:22). We note that it is a place of unending torment, that the rich man couldn’t return to warn others in his family, that “those who want to go from here to you cannot, nor can anyone cross over from there to us”, so that the rich man could not cross over to Lazarus nor could Lazarus cross over to where the rich man was, that the rich man was thirsty; this means that he had his senses all in tact. He knew about his unsaved family, he was in torment from flames, he could not quench his unquenchable thirst, and that his lost family only had the Bible to know how to be saved (Moses and the prophets). There is no mistaking that this place was quite real to the rich man. The rich man didn’t go to hell because he was rich or because he didn’t take care of the beggar Lazarus, but that he didn’t believe “Moses and the prophets” or the message of salvation found in the Bible. We really don’t know exactly where hell is but we do know that it is a real place and a place of unending torment. Does it really matter where it is since we know that it is a place? You will notice that the rich man was by himself too. It is not like you see pictured where the Devil is poking people with a pitchfork or where there will be others gathered together with each other but it will be utter aloneness. It will be sheer torment – both physical and mental – as you remember that the rich man had all of his memories still active of his family and of Lazarus. Those who will be in hell will live with eternal regret that they failed to trust in Jesus, that they ignored all of those who tried to share their faith with them, and they will be forever separated from God with no second chance. Jesus spoke more about hell than heaven. Thirteen percent of all of Jesus’ sayings were about a hell fire. Now that we know that heaven and hell are real places, where do you think you will end up? If you were to die tonight or if Christ would return today, do you know for sure where you would go? If you are not sure at this very moment, it is still not too late. God told Ezekiel to “Say to them, ‘As surely as I live, declares the Sovereign LORD, I take no pleasure in the death of the wicked, but rather that they turn from their ways and live. Turn! Turn from your evil ways! Why will you die, O house of Israel?’ because God has said” (Ezk 33:11). We know from Scripture that God “wants all men to be saved and to come to a knowledge of the truth” (I Tim 2:4). Please remember that “The Lord is not slow in keeping his promise, as some understand slowness. He is patient with you, not wanting anyone to perish, but everyone to come to repentance” (2 Peter 3:9). So my advice to you is to “Repent, then, and turn to God, so that your sins may be wiped out, that times of refreshing may come from the Lord” (Act 3:19). Why? “For he does not willingly bring affliction or grief to the children of men” (Lam 3:33). God doesn’t send anyone to hell. People send themselves there by their rejecting Jesus Christ as Lord and Savior. Decide today for tonight or tomorrow, if you were to die, or if Christ would return, you would be lost forever. No one has any guarantee that they will live beyond tonight or tomorrow. Tomorrow may be too late. When you die or when Jesus returns, He will either be your Judge or your Savior (Rev 20). Decide right now because, “now is the accepted time; behold, now is the day of salvation“(2 Cor. 6:2). I believe that heaven can not thoroughly be explained, even by the Scriptures,bible the bible talk about heaven is a real place and there are angels there who all day, and all night pray of GOD We really don’t know exactly where hell is but we do know that it is a real place and a place of unending torment. Excellent job again Jack. You articulated this so eloquently. I love your verses on heaven. It reminded me of a wonderful sermon I heard a few years back. Your conclusion was brilliant and reassuring to those who don’t have a relationship with Christ. Well done! Thanks Derek. Hell is a difficult subject to mention, but the gospel must be told in its full entirety. As always, your “Barnabas-speak” is always edifying brother and I truly thank God for you friend. So often we focus our attention on the things of the world so much that we lose sight of our real destination and our eternal purpose for being here. Thanks again for reminding us of our true destination and our commission of sharing the path to that destination with others. God bless you, brother. Thank you Robert. I know that Jesus spoke more on hell than any other single topic so we reveal the realities of hell honestly. The good news means nothing unless we first tell them that bad news of God’s judgment. Thanks friend. Hell is where GOD isn’t, not to mention it really is hot as hell!!! I read the book 23 minutes in hell, great wakeup book!! One thing for sure, I DEFINITELY, POSITIVELY, WITHOUT A DOUBT do not want to go to hell, give me Heaven any day! Amen Chris. That was my conclusion. Hell is the absence of God and light and heaven is not so much a place as it is a Person and the Person of God. Thanks brother. Love your sense of humor. Those who have good sense have a good sense of humor. Hello jack,thank you for your words about heaven and hell,please is there a bible verse about where hell is it? Thank you Ajayi. We have another writer here, Pam who wrote an article that contains Bible verses about hell at the link below. Let me say that we don’t know exactly where hell is but it’s not so much about where but about what it is like that makes hell what it is. It is utter darkness, eternal torment, and sheer and unending horror. See the link below for more on hell. I believe that heaven is your own personal place of beauty. If you can’t dream of what your heaven is…How do you know it exists? I was born Christian. At the age of 13 I started having nightmares about the Holocaust. No one in my family was Jewish during World War II, or perished in concenctration camps. I am now 41. I have spent 2/3 of my life having nightmares. MOST people in this world have a choice in regard to viewing, learning, or seeing what happened during the Holocaust. I am not one of those fortunate souls. Are you? I told no one about my nightmares for years. At the age of 25…I finally told just one: My fiance. He was the most wonderful man. And, in many ways he saved me like no other could. 3 months before our wedding, he died of a heart attack. I love you. I will always love you. It matters not if we are in the same dimension or universe…Wherever you are, I will be with you. In no way was the chemistry in my brain ready for him to stop breathing on me. I have been to shrinks, and on pills for depression throughout my life. This sadness cannot be fixed. And, while I am still breathing and have physically kept going…I will forever feel abandoned. Is heaven real? Yes, I do believe it is. Are there many mansions and palaces in it? Yes, I do believe there are. If you were tortured…like those who perished in the Holocaust….I believe those souls went to a very special mansion in heaven….to an untouchable place that our eyes are not allowed to see. We don’t deserve to. Give Barry back to me. Bring him back. or the one who stopped believing in the power of true love. I don’t care about palaces or mansions. What’s the point…if the person you love is not in it? I don’t care if I never get to see the most beautiful places up there…It matters not to me. I believe that if there is a heaven? It’s what you dream it will truly be. I want to have the wedding I never got to have. I want to be with Barry and travel around the universe discovering all of those things that we didn’t get to do together. My largest fear is that when I stop breathing? I’m aborted BACK in time….BACK to World War II, and forever stuck there as a jew…being persecuted in a concentration camp. IF you believe in heaven? It’s because you knew hell existed…first. I am from India. My name is SATYA SHOBHAN DAS and I am 68. I read your heart rending thoughts over your lost love. I want to comfort you through these following few lines. First of all, accept that you are one among the millions who have lost their most loved ones exactly as you have. Secondly, accept that such love is physical and temporary: it dies away when we are gone from this physical world and we can NOT carry it with us to our next existence because this belongs to this temporal world. Thirdly, what Barry told you before he departed can NOT be possible because he has no control on himself in his next existence – you too, will not have that in your next existence. I had told to my loving Daddy before he died and he replied, “Son, I will NOT be in my own control in my next existence”, and it is already more than 40 years now, nothing has happened according to my desire or wish. Fourthly, accept that you can not go to him and he can not come to you. Fifthly accept that God is in control of everything in his creation and nobody can override His will, rather, we all have to accept His will and this acceptance can only be possible if we know Him, obey Him and love Him. Job is an example: read what he said in Job 1:21 and 2:9,10. Also read Habakkuk 3:17-18. Sixthly, we can not live with our spouse eternally. This is a hard truth. Recently a “Just Married” happy couple were returning home from the place of marriage, met with an accident on road, the groom died on the spot, but the bride came out unscathed. It was a pretty love marriage, too! Seventhly, we should not, therefore, be too much attached to such worldly relationships which we only make, but rather we should know the unfailing love of our Creator, Father, who gave Himself in love for us, and love Him more than anything in the world. This love can be carried into our next eternal existence. Dear Sister, whenever you are in mental trouble please try to sing this song (you can get the complete recorded song from the internet), and I am sure, the Lord will fill your heart with His comfort and peace as He has also given me! May the peace of God be with you – Shalom! 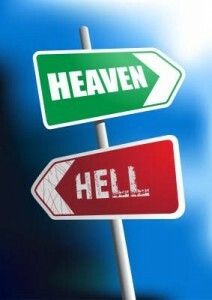 Great read, Does it really matter where Heaven or Hell is? , all that seems to matter is: wow what an opportunity for us Gentiles. This is awesome. It’s spoken perfectively the way it should. I honestly believe that the time the lord comes is unknown. I have a question also about the paranormal. Will the people of God seen in the form of a apparition frighten you? Hello Tim. Thank you for your question sir. I am a bit confused by your question which was, ” Will the people of God seen in the form of a apparition frighten you?” Do you mean when or if the people of God (Christians?) see an apparition, will it frighten them? Are you talking about “ghosts” or demons? Not sure what you mean. The paranormal involve fallen angels called demons and they have no power over us and can not make us fearful. Are you on facebook Jack? Pls reply to this message with your fb Id, love to read more from you thanks. Please check u s out as we have many of our articles posted on it and “Like” it if you want to. Thank you Ola. Thank you sir jack wellman..am really impressed with these subjects(heaven and hell)..heaven is a place where God is…but about hell i was told that its in the underworld…please i need an explanation? Hello Muyiwa Green. Please re-read the end of the article with the section called Where is Hell? There is no “underworld” that hell is supposed to be. Please read the end of this article and find out what the Bible says about hell. It doesn’t matter WHERE it is but that it is a place of torment from which there is no escape. Thank you for your question sir. Reading articles like this always make me feel better. I am only 18 years old but since i was about 13/14 years old I have started to become terrified of dying. I have always been a Christian and have accepted Christ as my Saviour, but I still do not feel I am good enough to enter Heaven when I die, I sin, and I know we are all sinners, but I feel that when I do it has been one too many. I always pray at night. For the days He has given me and for giving me the knowledge to know Him, I always ask that he forgive me of my sins too.. But I still have sleepless nights thinking about what if He does not see that I am worthy of entering Heaven? Is there anything that I can do to reassure myself? I know this might sound silly to some but my most important goal in this life is to make it to Heaven and pass this test that is life. Mr. Anderson, this is not silly at all and I so respect what you wrote that you feel unworthy to enter heaven. The fact is that not one of us humans who have repented and trusted in Christ are worthy but He makes us worthy (2 Cor 5:21) and that’s why it is called grace. It is free, it is unmerited and it is unearned which none of us deserve. That is the definition of grace. If you pray and read your Bible every night and perhaps focus on the Gospel of John and then the books of 1st, 2nd, and 3rd John, I believe these will make you feel more secure. The very fact that you feel unworthy shows that you see yourself as a sinner and that we can’t possibly make it on our own but it is a matter of trusting God and what Jesus says (i.e. John 6:37, 39 & John 10:28-29). Read John including the books of 1st, 2nd, and 3rd John and I believe you will feel better sir and thank you for your concerns sir. Heaven can only be in extra dimensions beyond our four of time-space. Currently Science has very little knowledge about it. The general relativity string theory and quantum entanglement phenomena accepting existing of extra dimensions as reality. We need still wait maybe very long time until Science in physics to discover it and this will be reality like anything else which each beyond our senses. Alternatively God will uncover for us heavenly physics by joining heaven and our planet into one common use reality to live in. This fact Jesus promised us on his second coming, which sounds interesting for me. I think that you are completely correct. Heaven is an undescribable place. think about the feeling that we will obtain when we see our long lost loved ones again after them being dead and what feeling and what impact that will have on us when we are there. Dear Jack Wellman, your article was great reading and learning for me! See also if you could access my God inspired book navicy.wix.com/understanding. Share extensively with others. God richly bless you. Thanks. Christ is the only answer. Anything else you seek means nothing. i love what all of us are saying for the word is truth. And as we ponder and image as it has always been from generations unto generations over this lone issue, that is how we shall never reach the limit. Some say hell is where God is not present. Did the word say there is a place where God is not present which is called Hell? For God is present everywhere and he created everything. Read in the beginning God created the heavens and the earth. why do we go ways which we are not to go. Only him knows what we are looking. even the things that he created in the heavens and the earth just saw themselves existing and everything is so good. My brethren Heaven is seen. if you want to see it, only one thing is possible. To know more get to me and he will see you through. Does the Bible (I use the KJV version) say in any place that hell is in the center of the earth? Hello Lorraine. I have not found a Bible verse that says hell is in the center of the earth. We’re to have new heavens and a new earth after Jesus returns (Rev 21:1-5). Let us try to practice to understand the spiritual operation. Because we cannot understand the things of the spirit in flesh.Be spiritually fit at all time. Heaven is a real place. In the story of the tower of babel, the bible states that if the people talk in one voice they will be able to build a tower that reaches heaven. Therefore, God changed their voices(languages) so that they no longer understood one another. Next post: Are Mormons Christian? What Do They Believe About Jesus?